Hats off to Richard Sivél whose unstinting efforts have once again allowed thirty-three players from all over the world to gather in the confines of the ACUD theatre in Berlin to fight it out for the title of Friedrich World Champion. For a four-player game, thirty-three is just the wrong number of competitors to have. So as well as being organiser, referee, official photographer, pizza-orderer, Fimo cube manufacturer extraordinaire and setter-up in chief, Richard also had to play in every round and find eight extra players to fill in. Nevertheless, despite all the extra work everything went off very smoothly indeed and both veterans and newcomers had a thoroughly enjoyable time. Here’s just a brief run-through of my four games to give an idea of the atmosphere. Friday evening’s game saw me in the role of Elisabeth, commanding the Russian hordes, with the ever-gracious Klaus Blum as Friedrich. I couldn’t have draw a better start. Klaus is an old hand and opted to defend against me in clubs, with one army ensconced in Soldau covering the last East Prussian objective and another in Kammin. He skilfully kept me at bay and for quite a while it looked like I would only score three or four points. Knowing time was short, I kept up the pressure, recruiting fresh armies and flinging them into the fray just to wear down the Prussian hand in clubs. Meanwhile, Stephan Jordan’s Austrians were busy in Saxony slowly gaining ground against stubborn resistance. The French left the game reasonably early and took over the Imperial Army. Unfortunately for the allies, the inexperienced Madame Pompadour made a terrible mistake by occupying Dresden and thus cutting off the only safe retreat for the white triple stack. Klaus didn’t need to be asked twice. With the loss of the main Hapsburg force, the game was all over bar the shouting. Elisabeth had succumbed just as her armies were beginning to get the upper hand, but on their own the Swedes could mount no more than a few pinprick spoiling attacks. Eight points is a reasonable haul, but twelve would have been so much better. On Saturday morning I took the role of Maria Theresa, with John, one of three players from York, playing the part of the King of Prussia. 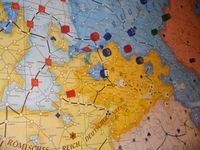 I chose the Saxony-first opening, with three armies and twenty-four troops earmarked to take Radeberg in short order, with the option of helping the Imperial Army to victory. John had his own plans, basically to avoid combat until his hand had built up sufficiently to form a solid defence. This however meant rapidly giving up territory, but then put him in an unassailable position against me with a triple stack dug in in the middle of the clubs sector in Silesia. So, an attempt to win with the Imperial Army looked the most promising. Meanwhile Daniel Dunbring’s French had made ground rapidly and were closing in on Magdeburg when Louix XV pulled out of the war in turn seven! Back to the drawing board and the prospect of chipping away at that stack in Silesia. It was not to be. Fate intervened and by turn fourteen it was all over. Ten out of twelve objectives meant that I was firmly placed in the middle of the table, needing two wins to have an outside chance. The third game saw me in control of the French armies, this time up against another newcomer as Prussia. He didn’t play at all badly, carefully considering his every move, but his inexperience soon started to tell and he was losing ground on all fronts. Bad luck also dogged him, with early subsidy reductions further curtailing his room for manoeuvre. Soon enough all the allies were closing in on their last objectives, with the distinct possibility of a three-way victory. Rodrigo’s Russians successfully placed their last flag, Daniel’s Austrians were just one short and I faced a battle to the last heart to capture Magdeburg. Despite a small numerical advantage and spending two reserves, I was still two points short. Two points of TCs that meant the difference between nine points and eleven and a half. As in both previous championships I’ve attended, I had to wait until Sunday morning to take on the most difficult role, that of Friedrich himself. And again, just as on the two previous occasions, luck would have it that opposing me was ex-champion and expert player Anton Telle, this time as France, with ex-champion Björn Apelqvist as Elisabeth. ¡La hostia! The presence of two such strong players totally warped my thinking. I concentrated everything I had on keeping them at bay, inflicting Pyrrhic victories on both of them while completely ignoring the Austrians who were in the competent hands of Andreas Buschhaus. My half-baked idea that I could hold him off indefinitely giving ground slowly by repeatedly taking -1 retreats was just a daft pipe dream, and by turn sixteen I had come completely unstuck. A shame, since had I been better organised, victory would have come just two turns later. Nevertheless, I hope I have learnt a valuable lesson or two about what not to do. 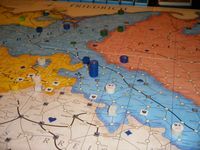 The 23-turn final was a lesson in exactly how Friedrich should do things. Manni calmly set about keeping the allies in hand while carefully conserving his precious resources. Well done and congratulations to a deserving double-champion. And once again many thanks to Richard for having invented such a great game and for putting in so many hours in order to make the World Championship such a success. I would also like to join Guy in thanking Richard for all of his superhumane efforts in organizing the 2013 Championship. 33 participants is an outstanding achievement, but everything went as smoothly as with the 2012 Championship, when less than half as many participants were enlisted. And I would like also to contribute with my point of view on the 4 games I played in this tournament. For the first game the World Champion Bjorn Apvelquist was commander of the prussian forces. He won after 17 rounds showing complete control of the situation. He played very quickly. At the end of the game the clock showed a 1-hour advantage for him. I was playing Russia, Maurice de Wijs was Austria, and Rodrigo Witzel was Pompadour. Bjorn made use of an unorthodox strategy as he moved Ferdinand with 8 armies and a supply train against Sweden. He managed to destroy Sweden and afterwards had Ferdinand in northern Brandenburg both holding Sweden in check and chasing the supply train. After Sweden dropped out of the game, Ferdinand was positioned to attack the russians, but then they also dropped out of the game. As Russia I made a mistake wich delayed me for 2 rounds. I placed an unguarded supply train in Waldenberg. Bjorn was quick to take the present with Dohna and then returned him to the clubs sector in Kammin. France seemed unable to take advantage of the missing Ferdinand. It took him a while to attack Magdeburg with a stack of 2 generals and 16 armies, and when he managed to do so it was to late and suffered a 11 point retreat in the very last round. Maurice took a while to discover that Silesia's defense was a sham made up of just 2 army points. Bjorn had concentrated 3 generals and 23 poits in Saxony. Maurice tried repeatedly to dislodge this stack with some 19 points while the other 11 points and 2 generals covered Silesia from a possible prussian comeback. In the end he was short from victory by Radeberg and many diamond points. 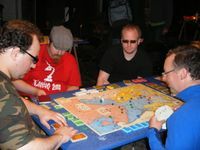 The next morning I played Prussia against Daniel Jensen (France), Malte Heinrich (Austria) and Andrew Brown (Russia). This game was a little chaotic for me and I made several mistakes. At a certain point in the game Andrew was very, very close to winning. He could have moved Ehrensvard to a blocking position in Kammin which would have forced the collapse of my defense there. But he decided to attack with the swedes, which were then eliminated. I gained some breathing space and shortly thereafter the russiand quit the game. Daniel Jensen took advantage of my early leaving of Magdeburg to conquer both this objective and Halberstadt. Fortunately for me, I had the right cards with Hannover to delay him until France quit the game before the situation deteriorated any further. Malte went head on with 21 army points against Saxony. This move unhinged my defense there as the diamond cards started to quit coming my way. I held him off for a long time but lost Radeberg. It also seemed that the Imperial Army might achieve a victory, but I was able to turn it back. Until the fall of Radeberg Silesia had been a rather quiet place, but then it was invaded by a great number of austrians. The situation there became critical as I tried to empty Malte's hand of spades with my leftover hearts. Finally, I was able to settle around Liegnitz and liberated Radeberg with some help from Ferdinand. For the saturday afternoon I had the great honor of sharing with 3 of the greatest Friedrich players around. Mark Luta was playing with Prusia. Anton Telle was Elisabeth. Klaus Blum was Maria Theresa. Despite the inspiration of such skilled tacticians my playing with the french this time was rather lousy. I let Cumberland escape to the southernmost part of the board and was unable to hunt him down until very late in a very long game (23 rounds), and after spending many points in hearts. IMO Elisabeth's early death was very decisive in this game. After all was over, Mark said he had everything under control from the very beginning. But from my point of view I couldn't figure out his strategy, as he seemed to be defending from clubs areas both against Russia and Austria. Despite some setbacks, Klaus never stopped attacking and in the end just Radeberg was left unconquered. In the Sunday morning game I was playing with Austria. The other 3 players were well known to me. 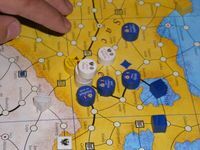 Andreas Zölitz was playing with the french, Arnold de Wijs was Prussia, and Richard Sivél himself was Russia (I think this was the 5th time within a year I played Friedrich with Richard). On the 2nd round I moved A2&A3 to Löbau with 15 army points and little regard for the threat of encirclement. I had 39 points in clubs plus a reserve, and this early in the game I was ready to let all those troops die in exchange for many prussian card points in valuable suits (hearts, clubs, and diamonds). Arnold forced the encirclement battle from hearts but lost it and was in turn encircled, losing 2 generals and 14 or 15 army points plus all his hearts. This early and crushing defeat seemed to make him feel rather hopeless. I tried to push him not too hard so that he could find time to divert forces against the other players. But the unexpectedly dire situation and an early subsidy reduction caused him to commit several mistakes wich ended in Richard's victory in round 10. This championship was a very interesting and grateful experience. Not just because of the games, but also thanks to the excellent people I met while playing. From this thread I send my best regards to all of those who took part in this event, and my most sincere congratulations to Manfred Wichmann, Champion of the Friedrich 2013 Tournament!. Thanks Guy and Jose for your very detailed reports ! Thank you also for coming to Berlin once again and for making the 8th FWC come true. I also enjoyed it very much It was a wonderful atmosphere.